Everyone of us hates our teachers specially when they make us to write our resumes. Even today, I never had a chance to create my own resume, since I have chosen the path of entrepreneurship. Nevertheless, for all those people who are afraid or are frustrated to write their own resumes, here we bring you a smart solution for all these problems with our Online Resume Maker. To be honest, it does the work absolutely perfect; infact the impression which is created by these tools always plays a major role than the rest of the tools. Everyone of us knows the fact that the better the resume is, the more likely are we near to getting placed in our dream Job. So if you are eagerly looking out for a better job, then these tools are the one which are going to help the most and bring out the best in your on papers. One of the main reasons why I like these resume builders is because these are good enough and also they structure your information in a better way making it to neat and stand-alone. While we are not going to deal with interview tips, but we do have a separate section for that as well where you can hell lot of tips and tricks. So quickly let’s get into the Resume Builder tools and make your resume to be one of the best with the help of the following 7 best resume makers. Cvmaker is one of the best tools which we have witnessed till now with the ability to create and modify resumes quickly in no time. One of the best features of this tool is that it’s pretty simple to use, create, modify, delete, import or export resumes. Another great feature is that it covers all the aspects of a Resume starting from basic to professional which is not just fast, but also so simple to fill-out. At the end of filling up all the required information, you get a clean and nice formatted resume, which is not just liked by you, but also by people who view it. Lastly, why I would recommend this tool to everyone is because it has the ability to import pictures which can be attached to the appropriate place to make the resume more stand-alone. We always understand that making resumes is one of the toughest tasks than actually getting job. This is one of the tools to create and save your information at one place, and then quickly adapt them into beautiful resumes. OnlineCV is one of the fantastic tools which allows you to upload a picture along with that also enable you to import your existing resume so that it can be tweaked and been given a fresh look. I would recommend this tool to everyone who is more interested in displaying his details in a better manner. 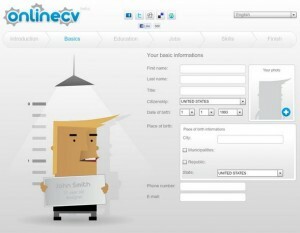 Also this tool allows you to download your resumes and enables to upload to the website wherever you want to. Resunate provides with the most formal way of creating resumes online. While one thing which I couldn’t find out here is the ability to upload image but although it’s more preferable since it makes life more easier. 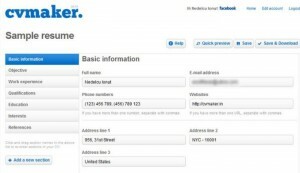 You just have to start updating your information and the tool will automatically do all the work for you. One of the best advantages of using it is that it provides you with the functionality which no other tools provide, which is the ability to structure your data with the way you want it to appear on your resume. At the end, I would just say, its not just a normal resume maker, but more than that. 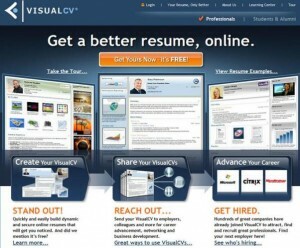 VisualCV always had a goal to bring out the best resumes in the world. Although the interface and filling up information pattern is not to easy or simple, but still if you are sticking to it then I am sure It will provide you with the best possible and surprising resumes. The only reason to go with this tool is that the end result is so professional and it provides information in a better and structured format. It only works for all those people who have patience in filling up information. One of the surprising things is that it also allows you to upload a picture, and helps you to convert your resume into PDF format as well so that quickly it can be printed the way we want it to appear. 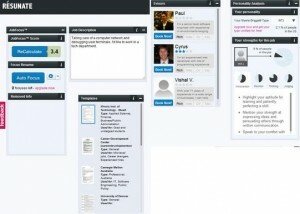 JobSpice provides you with a beautiful interface to create your resumes. With hell of information to fill out to create the best possible resumes with the way of structured information. It brings out the best in user by taking various resources and then strutting them into beautiful resume and thus you can get a professional resumes. Praux doesn’t come out with friendly User friendly interface but the end result of theirs is just awesome to describe. One of the best features of this tool is that they have their own predefined themes, wherein user can just select one of them and get started, but if the user wants to input a custom theme, even that selection can be made. One of the simplest forms of making resume is by using this tool, no unnecessary graphics at all to cluster your resumes. 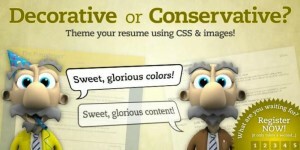 As far as Online resumes making with the help of theme is concerned, I would prefer this tool always. If you want to create a beautiful resumes, then you should always go with this tool alone, as SpongeResume tag says “Have a Great Resume Your Way”. This is true as well in all possible cases, which come out with lots of customization and cool features. One of the best ways to use this tool is to just follow out what the interface says and you will be done. When it’s ready, you can just download it and get your resumes on your way. We have already shown you some of the best resume maker, and our list ends up here with ResumUp, over here you just have to update your resumes and all your terrific information will be converted into awesome presentation. This is one such tool which is purely based on Visuals, as obvious everyone today like only visuals. One of the biggest mistakes which most people often make is by not selecting and creating a perfect resumes. Please don’t be in such a mistake that resumes are not given importance these days. To avoid all these problems, we have gathered some of the best Online resume maker tools and provided to you above so that you can also make a cool resume and clear your interview level easily. This will ultimately help you to get the best job and will thus enable you to achieve your goals. Hi, you left my favorite one off the list. I have used VisualCV and CVMaker, but I love Resumebear the most. They have a free online builder, free delivery and a really cool tracking feature that alerts you when your resume is viewed via sms msg. Plus their templates are the best, you literally can make 1000 different styles. AND Yes I found a job ! Good luck to all searching for a job – hang in there – after 9 months I finally found a great job that is in line with my experience and expertise. Great articles btw! Thanks for sharing. 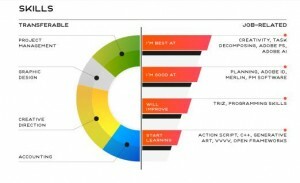 I’m testing this resume maker tool right now and looks very promising. If you need help about CV Builder service then contact us. We provide best career advisor with best services. 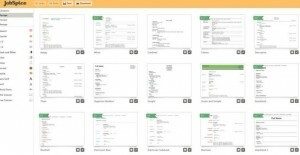 Kedals.com is a great free online resume builder.